Join Jacksonville Moms Blog for a Daddy Daughter Date Night at The Mini Bar with Cortello Salon to help dads learn simple dos! Join Jacksonville Moms Blog for a Daddy Daughter Date Night at The Mini Bar! Stylists from Cortello Salon will be there to help dads learn how to do simple hair styles in their daughter's hair. This is a perfect bonding opportunity for dad's and their daughters and now dad won't be completely lost when mom is out of town or when their daughter just asks dad to do their hair! 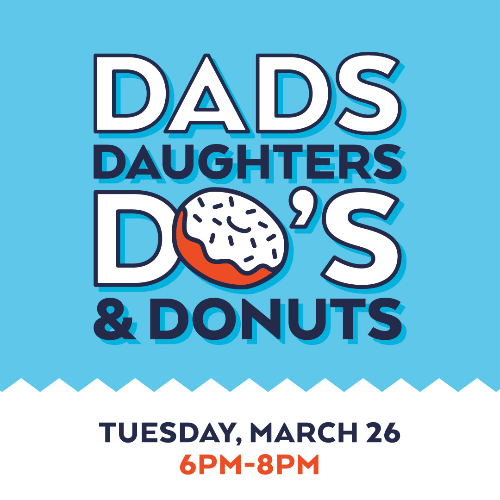 Each Daddy Daughter ticket will include a 3 pack of donuts to decorate, a beer for dad (the bar will be open for an additional purchase), and a hot chocolate bar for the girls, and styling lesson by Cortello. We also have a sibling ticket available if dad has more than one daughter that includes a 3 pack of donuts to decorate, hot chocolate bar, and styling by Cortello.